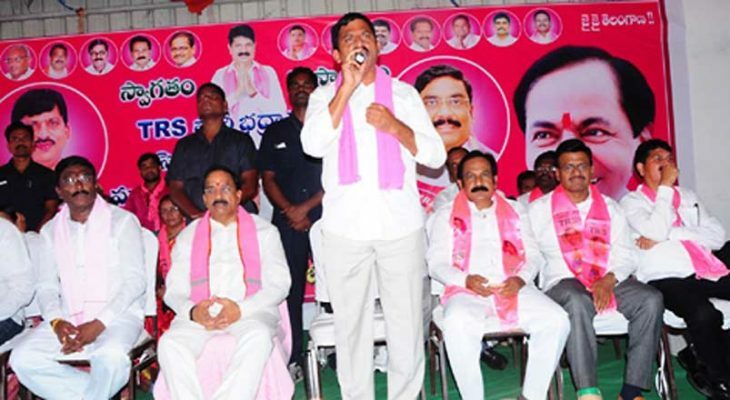 Bhadrachalam: Chief Minister K Chandrashekhar Rao has created wonders in his four-and-a-half years of rule, asserted senior TRS leaders here on Thursday. Roads and Buildings Minister T Nageswara Rao along with Khammam MP Ponguleti Srinivas Reddy took part in Atmeeya Sammelanam at Bhadrachalam Assembly constituency. Addressing the gathering, they said the Chief Minister was known for his concern towards the poor, suppressed classes, farmers and minorities. Each and every section of society benefitted with the developmental and welfare measures introduced by the Chief Minister. The Chief Minister is planning to develop Bhadrachalam much better than Yadadri temple so that it lasts for decades. Prakarams and other structures are under the designing process. Foundation stone will be laid by Chinna Jeeyar Swamy and the CM after the designing is over, he said. He said the Left parties were falsely accusing the government of neglecting the temple development. The temple has to be developed as per Agama Shastras and advice of experts. It cannot be done in a hurried manner. A fund of Rs 100 crore has already been allotted for development works, he added. He stated that developments on a large-scale had taken place in the Bhadrachalam Assembly constituency. The government has developed karakatta to prevent flooding of villages, even after water level reaches above 50 feet. Works related to a second bridge over River Godavari is under way with Rs 100 crore. He asked MLC B Lakshminarayana to take the responsibility of ensuring the party candidates’ victory by coordinating with party workers. MP Srinivas Reddy said that the Chief Minister with his welfare and development programmes had cleared all apprehensions expressed by many over Telangana’s future. “Now Telangana and the Chief Minister have become role models for better governance in the country,” he said. Heasked party leaders and cadres to work in coordination with each other and ensure Venkat Rao’s victory with huge margin. “Venkat Rao is a well-known doctor in Bhadrachalam and serves patients with a service motto,” the MP said and urged him to continue his medical practice even after becoming MLA.